The southernmost part of Pluto that NASA's New Horizons spacecraft could "see" during closest approach in July 2015 contains a range of fascinating geological features, and offers clues into what might lurk in the regions shrouded in darkness during the flyby. The area shown above is south of Pluto's dark equatorial band informally named Cthulhu Regio, and southwest of the vast nitrogen ice plains informally named Sputnik Planum or Sputnik Planitia, as the mission team recently redesignated the area to more accurately reflect the low elevation of the plains. North is at the top; in the western portion of the image, a chain of bright mountains extends north into Cthulhu Regio. The mountains reveal themselves as snowcapped — something hauntingly familiar from our Earthbased experience. But New Horizons compositional data indicate the bright snowcap material covering these mountains isn't water, but atmospheric methane that has condensed as frost onto these surfaces at high elevation. Between some mountains are sharply cut valleys – indicated by the white arrows below. These valleys are each a few miles across and tens of miles long. A similar valley system in the expansive plains to the east (blue arrows) appears to be branched, with smaller valleys leading into it. New Horizons scientists think flowing nitrogen ice that once covered this area -- perhaps when the ice in Sputnik was at a higher elevation -- may have formed these valleys. The area is also marked by irregularly shaped, flat-floored depressions (green arrows) that can reach more than 50 miles (80 kilometers) across and almost 2 miles (3 kilometers) deep. The great widths and depths of these depressions suggest that they may have formed when the surface collapsed, rather than through the sublimation of ice into the atmosphere. 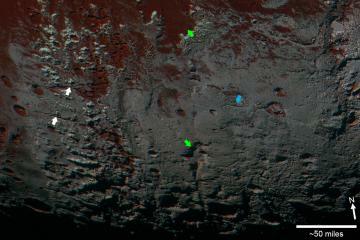 This enhanced color image was obtained by New Horizons' Multispectral Visible Imaging Camera (MVIC). The image resolution is approximately 2,230 feet (680 meters) per pixel. It was obtained at a range of approximately 21,100 miles (33,900 kilometers) from Pluto, about 45 minutes before New Horizons' closest approach to Pluto on July 14, 2015.